1. Reparation to the Twin Hearts, the Sacred Heart of Jesus and the Immaculate Heart of Mary for the innumerable sins of impurity and immodesty committed daily over the world. 2.The success of the Marylike Crusade in: a.) Promoting Marylike chastity and modesty; b.) In hastening the triumph of the Immaculate Heart of Mary. 1. Recite daily three Hail Mary's for personal purity and modesty, each Hail Mary to be followed by the indulgenced prayer, "By Thy Immaculate Conception. O Mary, make my body pure and mv soul holy." 2. Consecrate myself daily to the Immaculate Heart of Mary by any approved "Act" (or at least in your own words). 3. Wear the Brown Scapular always. 4. 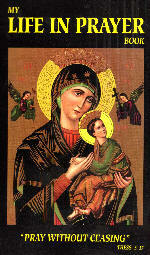 Wear the Green Scapular or carry on your person. 5. Attend and pray the Holv Sacrifice of the Mass as often as possible. 6. Receive Holy Communion as often as possible. 7. Go to the Holy Sacrifice of the Mass on First Fridays and receive Holy Communion if possible. 8. Observance of the First Saturdays of each month (according to our Lady's intentions) consisting of Holy Mass and Holy Communion: reparation to Mary's Immaculate Heart: the Holy Rosary; plus a 15-minute meditation on the mysteries of the Holv Rosary. 9.The daily Holy Rosary. This is a must. We cannot emphasize enough the importance of saying the Holy Rosary daily. 10. Holy Hours of prayer when possible. Either before the Blessed Sacrament if possible or at home. 11. Daily Sacrifices offered to our Heavenly Father through the Immaculate Heart of Mary. 12. To venerate the Blessed Mother as my model, striving each day to please God by the avoidance of sin and the imitation of Her sublime virtues. "Let them offend God no more, for He is already much offended." 13. To practice chastity and modesty habitually, both exterior and interior. "More souls go to hell because of sins of the flesh than for any other reason." 14. To add after each decade of the Rosary, "Oh my Jesus, forgive us our sins, save us from the fire of hell, and lead all souls to heaven, especially those who are most in need of Thy mercy." 15. Go to private confession often. We suggest every two weeks. 1. To strive to be modest in thought, word and conduct, at all times and in all places. 2. To refuse to wear the pagan fashion known as "shorts"
4. To wear only such dresses as meet the Marylike Standards. 6. Reread often the contents of this book.